The façade of the new Centro*Arezzo Coop.fi shopping centre is the key element in Piuarch’s redevelopment project. The pattern characterising the building was created by taking apart the coop logo. There is complex project hidden behind the façade of the new Centro*Arezzo. The façade is the most important element in Piuarch’s redevelopment project on this complex of buildings constructed in the late 80s, but the architects’ design aims to come up with a new concept that may be extended to today’s commercial districts. The intention is that the project will offer a possible response to the problems raised by "non-places", as defined by French anthropologist Marc Augé. The redevelopment project, conducted without interrupting business in the centre, included complete aesthetic and functional redefinition of indoor and outdoor spaces, creation of new areas such as an internal plaza where people can meet and socialise, and renewal of signage and coordinated archigraphy. The project concept is based on the Coop logo, designed by Albe Steiner in 1963 and revised by Bob Noorda in 1985. Piuarch breaks down the logo to use its key elements, the circle and the unbroken strip, to define the project’s visual identity. The façade, totalling 2500 sqm, appears to be composed of two strips: a continuous ribbon forming the base, in the traditional colours of local terracotta; and a white upper strip with holes of various different sizes arranged over its surface in a regular grid pattern. The façade becomes an urban landmark with an optical effect, interacts with natural light by day to give the building an ever-changing appearance, and underlined by artificial light at night. 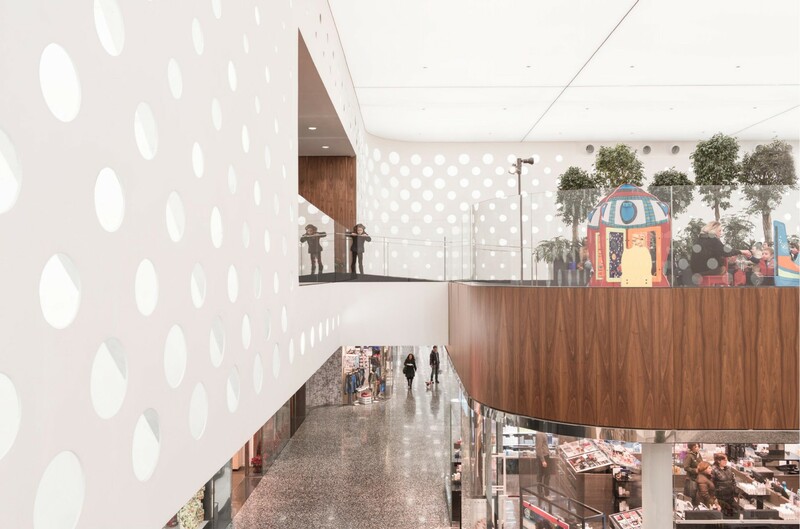 The circle pattern also accompanies visitors on the false ceiling in the mall, up to the vertical walls of the plaza establishing visual continuity between inside and outside.